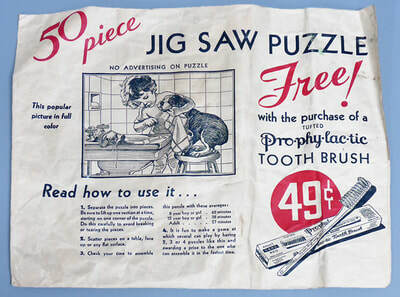 The Pro-phy-lac-tic Brush Company offered this 50-piece puzzle as a free premium with the purchase of a Pro-phy-lac-tic tooth brush beginning in 1932. 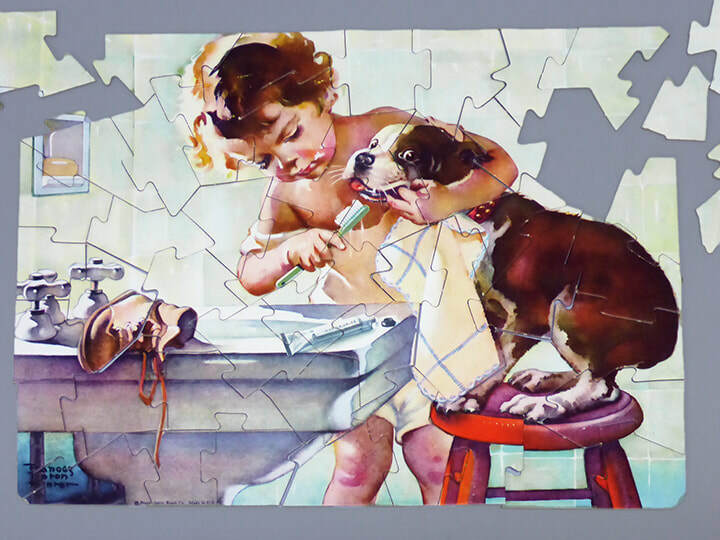 The puzzle features an image by illustrator Frances Tipton Hunter (1896-1957), who created covers for The Saturday Evening Post and many other magazines between the 1920s and 1950s. Anne D. Williams of Bates College researched this puzzle for her book, The Jigsaw Puzzle: Piecing Together a History (New York: The Berkley Publishing Group, 2004). The puzzle was offered as a free premium with the purchase of a Pro-phy-lac-tic toothbrush beginning in 1932. According to the accompanying envelope, the toothbrush sold for 49 cents. The advertising campaign was created by Einson-Freeman Company, a specialist in display advertising in Long Island, New York. The company made prototypes of four different premiums: the jigsaw puzzle, a leatherette kit with samples of Lambert Company products, a nail brush and a disk chart of state capitals, populations and facts. Sales in test markets revealed that the jigsaw puzzle had the biggest impact with sales increasing 400%. The company ordered 1 million puzzles and countertop displays to distribute to retailers. The advertising campaign created a huge increase in sales and led to an advertising puzzle craze in the 1930s as other makers of consumer products followed the company’s example. ​for sale in the Historic Northampton Museum Store.